All colonial newspapers appeared weekly and were sold by subscriptions. While most colonial newspapers had circulations of between 500 and 1,000, the Massachusetts Spy had a circulation of 3,500 from subscribers throughout the thirteen colonies making it the most popular American newspaper at the time. Designed specifically for the middling or middle class of craftsmen, the paper was founded in 1770 by Isaiah Thomas and his former master Zechariah Fowle, later Thomas would buy out Fowle and publish the Spy on his own. While Thomas initially tried to make the Spy an impartial voice, he soon found it impossible to do so in Boston the epicenter of the growing imperial crisis. Thomas’s strident Whig position is evident in his writing and in his text above the masthead: Americans! –Liberty or Death! –Join or Die! Thomas’s views frequently got him trouble with the Royal authorities and under the advisement of John Hancock and with the assistance of Timothy Bigelow and Joseph Warren Thomas smuggled his press out of Boston during the night of April 16, 1775, and removed it to the inland Whig stronghold of Worcester. When paper finally arrived in early May he was able to publish this edition, the first thing ever printed in Worcester. As was customary with Colonial newspapers the breaking news appeared in the inside of the publication and thus on page three is Thomas’s account of the battles of Lexington and Concord. 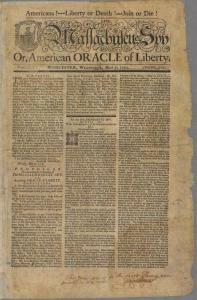 The Spy was one of 27 Colonial newspapers that carried news of the battles at Lexington and Concord. But Thomas’s version is one of the few that is clearly an eyewitness account. Because Thomas was present at the fighting, the historian of journalism Frank Luther Mott, credits him with being America’s first war correspondent. Americans! forever bear in mind the BATTLE of LEXINGTON! where British Troops, unmolested and unprovoked wantonly, and in a most inhuman manner fired upon and killed a number of our countrymen, then robbed them of their provisions, ransacked, plundered and burnt their houses! nor could the tears of defenseless women, some of whom were in the pains of childbirth, the cries of helpless, babes, nor the prayers of old age, confined to beds of sickness, appease their thirst for blood! - or divert them from the DESIGN of MURDER and ROBBERY! The particulars of this alarming event will, we are credibly informed be soon published by authority, as a Committee of the Provincial Congress have been appointed to make special enquiry, and to take the depositions, on oath, of such as are knowing to the matter. In the mean time, to satisfy the expectations of our readers, we have collected from those whose veracity is unquestioned the following account, vis. A few days before the battle, the Grenadier and Light-Infantry companies were all drafted from the several regiments in Boston, and put under the command of an officer, and it was observed that most of the transports and other boats were put together, and fitted for immediate service. This manoeuvre gave rife to a suspicion that some formidable expedition was intended by the soldiery, but what or where the inhabitants could not determine -- however, the town watches in Boston, Charlestown, Cambridge, etc. were ordered to look well to the landing-place. About 10 o'clock on the night of the 18th of April, the troops in Boston were discovered to be on the move in a very secret manner, and it was found they were embarking in boats (which they privately brought to the place in the evening) at the bottom of the Common; expresses sat off immediately to alarm the country, that they might be on their guard. When the expresses got about a mile beyond Lexington, they were stopped by about fourteen officers on horseback, who came out of Boston in the afternoon of that day, and were seen lurking in bye-places in the country till after dark. One of the expresses immediately fled, and was pursued two miles by an officer, who when he had got up with him presented a pistol, and told him he was a dead man if he did not stop, but he rode on until he came up to a house, when stopping of a sudden his horse threw him off; having the presence of mind to hollow to the people in the house, “Turn out! Turn out! I have got one of them!” the officer immediately retreated as far as he had pursued: The other express after passing through a strict examination, by some means got clear. The body of the troops in the meantime, under the command of Lieut. Colonel Smith had crossed the river and landed at Phipp’s Farm. They immediately to the number of 1000 proceeded to Lexington, 6 miles below Concord, and with great silence. A company of militia, of about 80 men, mustered near the meeting-house, the troops came in to fight of them just before sun-rise; the militia upon seeing the troops began to disperse. The troops then sat out upon the run, hallowing and huzzaing, and coming within a few rods of them, the commanding officer accosted the militia in words to this effect, "Disperse ye damn'ed rebels! damn you disperse!" Upon which the troops again hussaed, and immediately one or two officers discharged their pistols, which were instantaneously followed by the firing of four or five of the soldiers, and then there seemed to be a general discharge from the whole body. It is noticed they fired upon our people as they were dispersing, agreeable to their command, and that we did not even return the fire. Eight of our men were killed and nine wounded; The troops then laughed, and damned the Yankees, and said they could not bear the smell of gun-powder. A little after this the troops renewed their march to Concord, where, when they arrived, they divided into parties, and went directly to several places where the province stores were deposited. Each party was supposed to have a Tory pilot. One party went into the goal yard, and spiked up and other ways damaged two cannon belonging to the province, and broke and sat fire to the carriages - They then entered a store and rolled out about an 100 barrels of flour, which they unheaded, and emptied about 40 into the river; at the same time others were entering houses and shops, and unheading barrels, chests, etc., the property of private persons; some took possession of the town house, to which they set fire, but was extinguished by our people without much hurt. Another party of the troops went and took possession of the North bridge. About 150 provincials who mustered upon the alarm, coming towards the bridge, the troops fired upon them without ceremony, and killed two upon the spot! (Thus did the troops of Britain's king fire FIRST at two several times upon his loyal American subjects, and put a period to ten lives before one gun was fired upon them.) Our people then returned the fire, and obliged the troops to retreat, who were soon joined by their other parties, but finding they were still pursued, the whole body retreated back to Lexington, both provincials and troops firing as they went. During the time an express from the troops was sent to General Gage, who thereupon sent out a reinforcement of above 1400 men, under the command of Earl Percy, with two field pieces. Upon the arrival of this reinforcement at Lexington, just as the retreating party had got there, they made a stand, picked up their dead and took all the carriages they could find and put their wounded thereon; others of them to their eternal disgrace be it spoken, were robbing and setting houses on fire, and discharging their cannon at the meeting-house. Whilst this was transacting a few of our men at Menotomy and, a few miles distant, attacked a party of twelve of the enemy, (carrying stores and provisions to the troops) killed one of them, and took possession of their arms, stores, provisions, etc. without any loss of our side. The enemy having halted about an hour at Lexington, found it necessary to make a second retreat, carrying with them many of their dead and wounded. They continued their retreat from Lexington to Charlestown with great precipitation. Our people continued the pursuit, firing 'till they got to Charlestown-Neck, (which they reached a little, after sun-set) over which they enemy passed, proceeded up Bunker's Hill, and the next day went into Boston under the protection of the Somerset man of war of 64 guns. A young man, unarmed, who was taken prisoner by the enemy, and made to assist in carrying off their wounded, says, that he saw a barber who lives in Boston, thought to be on Warden, with the troops, and that he heard them say, he was one of their pilots; he likewise saw the said barber fire twice upon our people, and heard Earl Piercy order the troops to fire the houses : He also informs, that several officers were among the wounded who were carried to Boston, were our informant was dismissed. They took two of our men prisoners in battle who are now confined in barracks. Immediately upon the return of the troops to Boston, all communication to and from the town was stopped by Gen. Gage. The provincials who flew to the assistance of their distressed countrymen, are posted in Cambridge, Charlestown, Roxbury, Watertown, etc. and have placed guards on Roxbury neck within gun-shot of the enemy; guards are also placed everywhere in view of the town to observe the motion of the King’s troops : The Council of War, and the different Committees of Safety and Supplies set at Cambridge, and the Provincial Congress at Watertown. The troops in Boston are fortifying the place on all sides, and a frigate of war is stationed up Cambridge river, and a sixty-four gun ship between Boston and Charlestown. Deacon Joseph Loring’s house and barn, Mrs. Mulliken’s house and shop, and Mr. Joshua Bond’s house and shop, in Lexington were all consumed. They also set fire to several houses, but our people extinguished the flames. They pillaged almost every house they passed by, breaking and destroying doors, window, glasses, etc. and carrying off cloathing (sic) and other valuable effects. It appeared to be their design to burn and destroy all before them ; and nothing but our vigorous pursuit prevented their infernal purposes from being put in execution. But the savage barbarity exercised upon the bodies in our unfortunate brethren who fell, is almost incredible : Not content with shooting down the unarmed, aged and inform, they disregarded the cries of the wounded, killing them without mercy, and mangling their bodies in the most shocking manner. We have pleasure to say, that notwithstanding the highest provocations given by the enemy, not one influence of cruelty, that we have heard of, was committed by our Militia; but, listening to the merciful dictates of the Christian religion, they breathed higher sentiments of humanity. Exact Title: The Massachusetts Spy Or, American ORACLE of Liberty.